The ICMA-RC Public Employee Memorial Scholarship Fund (ICMA-RC Memorial Scholarship Fund) was founded in 2001 to honor the lives of our nation's police officers, firefighters, and other local and state government employees who have made the ultimate sacrifice. The fund provides financial assistance to the surviving spouses and children of employees who have died in the line of duty and are planning to attend an accredited two-year community college, four-year accredited university, or vocational school full-time. Each year, scholarships are awarded to selected students. Since its inception, the ICMA-RC Memorial Scholarship Fund has awarded more than $900,000 in scholarships to hundreds of recipients. 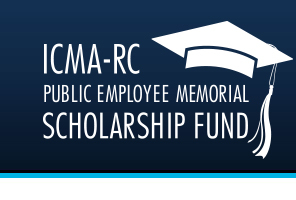 The ICMA-RC Memorial Scholarship Fund is a Section 501(c) (3) public charity. The fund's Board of Directors manages and oversees the eligibility and award selection process. Scholarships are managed and administered through Scholarship America, National Fallen Firefighters Foundation (NFFF) and the Concerns of Police Survivors (COPS). ICMA-RC is a non-profit independent financial services corporation focused on providing retirement plans and related services for more than a million public sector participant accounts and over 9,000 retirement plans. For more information, visit www.icmarc.org. © Copyright 2001–2018 ICMA-RC. All Rights Reserved.